With Aaron's wound freshly dressed by Luis as cleanly and comfortably as possible, he sets about to the task of constructing an attachment for his Dungeon Pig hoof peg foot (try to say that five times fast). He scrapes away the meat and skin from the hoof, cleaning it as well as he can with water and sanitizing with a bit of fire (away from the vines, of course). He strips some of the skin off of the Id Pig, hoping to use it to create leather components for his peg foot, but the skin is too soft and has too much fleshy gunk on it to use without hours of careful scraping. Abandoning this idea (but keeping the skin, just in case), Aaron looks for bits of wood he can use to create a sort of splint connecting the sides of the leg bone to a sort of pouch made of a section of his blanket (which is becoming less and less of a blanket and more and more of just loose fabric). The wooden planks extend up a bit to another strip of blanket, which Aaron uses to tie the peg foot to his stump leg. He tests out his new peg foot, making sure it can bear his weight and that it's not too painful to put pressure on that leg. "A-ha! Glorious day in the Maze to you! I pray to all the Gods-That-Remain that you find your dragons. 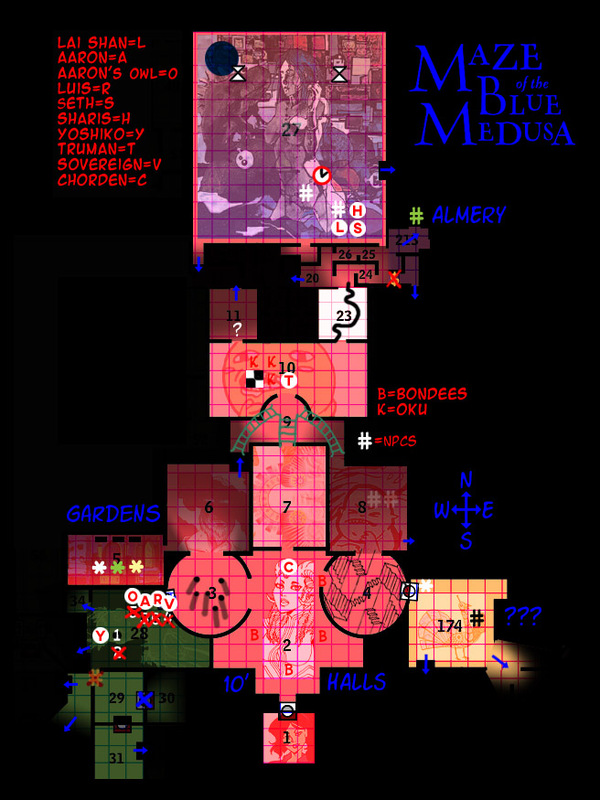 My office is within the Medusa's private Almery," he notes, and points Eastward. "I'm sure we will cross paths again soon!" You find additional materials in (Room 34), which turns out to be a basic gardening shed with all the necessary implements for the gardening trade. Trying to steady yourself on this makeshift prosthetic is bearable but still unpleasant. This recovery will take a great while. From your inspection of the vines, you see that fire harms them more than anything, even being severed. So it serves to reason that even severed, the life magic that infuses the vines remains intact. However, it is unknown how long this animating effect will last on the statues after separated from the main plant. Immediately, she beamed a friendly smile. "I'm glad you'll have us Ms. Torn, I'm very excited to be here! Everything I've seen in here so far has been far beyond my wildest imagination. I would love to see more!" Chronia is slightly taken aback by your enthusiasm, but returns your smile. "Oh...okay. That's a little weird. 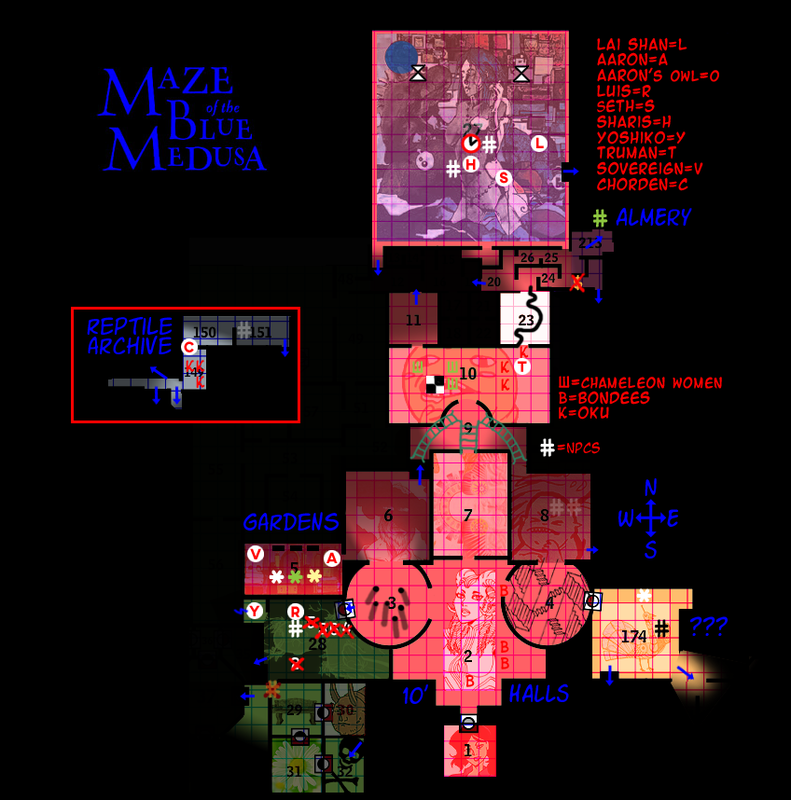 Most people are sobbing messes by the time they reach the center of the Maze. Still, it's nice that you're not like that. I mean, I'm glad." She smiles a little nervously. To your keen and experienced eye, you see the woman bare, and not just physically. She seems lonely and eager to entertain visitors, and she's more than a little tipsy. She searches your face and each of your party members' faces. For every smile she sees, her own grin brightens. As she enters her room, she chucks the candle stub in a wooden bucket with similar melted candles. "Come inside," she urges you. Chronia Torn's huge room is a warm cocoon of rotting silk and reflected light from chandeliers 50-feet up. Everything is beautiful and bright and falling apart. You see screens made from stacked glass and polished bricks of semiprecious stone. The floor is pale quartz sand, inch-deep over the rotted remains of granite flags. There are low lumps of abraded stone and the remains of sculpture, the only art to last. Chronia takes a seat on a small couch near the center of the room. Beyond her is a small spherical structure to the Northwest, where Fracture-of-the-Bone resides. The back of the room is guarded by two large figures. Two sinewy men with blue-black skin stand at attention, 7-feet tall from shoulders to toes. Upon their shoulders sit 2-foot tall hourglasses containing red-quart sand. They are armed with a long khopesh in each hand. "Tell me everything about everything," Chronia says as she sits, and offers you all cushioned stools close to her couch. Not too close, however. She drinks straight from a bottle of dark red wine. Ashen introduces your group as her saviors. She especially notes the fact that Sharis the Triton personally protects her, and two of the other adventurers are a gob with magic and a felinoid-hybrid. She is quite proud of these facts. Chronia doesn't seem as interested in that. "A lot has changed, Priestess," Chronia sighs wearily. "The Triarchy is no more. All your accumulated power holds no currency here." Lai Shan puts a finger to her chin and tilts her head quizzically, feigning ignorance. "I'm afraid there's not much to say, my lady. Our world is awfully dull. To be truthful, it is the reason we ventured into this maze in search of adventure." She takes a moment to glance around the room. She makes a mental note of the hourglasses' current volume of sand, so that she could reference it later. "However, Sharis here might have tales to tell from deep beneath the tides. Why, his entire odyssey is ascribed onto his very body!" Lai Shan claimed excitedly, trying her best to sell up the decorated ocean man. Chronia Torn pouts and takes another drink. "Oh poo, that's no fun," she sulks. "You sound just like this one, back in the day. 'No, Mistress, there is nothing worthy of you outside! Stay in this palace and we'll bring you everything you need! ', isn't that right?" She points at Ashen Chanterelle. Chronia barely conceals her wounded look. "You never knew what I needed," she tells Ashen bitterly. "None of you did. We three were just figureheads to you." Chronia is more enthused about this potentially juicy tale. "Oh, the triton!" she says with fascination. "I've always been told the tritons were the vanguard of the Triarchy! Did you know that?" She giggles. "Tell me everything about everything! What is your name? Where are you from? What are you doing in this godforsaken Maze?" Fracture-of-the-Bone ambles up to Chronia's couch and nibbles at her fingers. Wincing, Aaron turns to Yoshiko. "It would--ah--appear--hnng--that severing a vine does not immediately kill it, nor does it nullify the magic; however, I do believe the magic would fade over time. Perhaps if we can extract the roots and preserve the plant, our new--er--friend can come with us." Sharis pounds his chest, letting out a laugh that seems to emanate from his entire body. "HA! But only a few of the triton's mightiest deeds lie etched upon my skin! But indeed, Lai Shan, the Triton have many great tales to share to the few who remain who do not know them!" He turns to face their host as she addresses him. "The Triton served as the vanguard to the Triarchy? Ah, the Lady Torn must be speaking of the Three Sirens! I had never considered them to be one and the same. A translation lost on the tides I suppose! It seems you already know some of the glory of the Triton, but what, do you know-"
Sharis strikes a Herculean pose, flexing his body. "Of the Ahlorsath? Would you hear of Pylorus, he who stole the power of the storms, and shared a portion of it with all Tritons to follow? Would you hear of Reflyn, she who singlehandedly hunted and slew the mighty Red Kraken? Or perhaps Koralas, who pulled the Blue Dragon, who plagued the ships of land walkers, out of the sky so that his brothers and arms could slay the beast?" With every new story, he changes poses, flexing, emphasizing a different tattoo. He strikes one last pose, both arms to his side, emphasizing his abs, and the ornate tattoo decorating them. "Or perhaps the best to start with, is the first to bare the name? Primaris Ahlorsath, who swam deeper into the seas than any before him, alone, and found the ancient caverns for which the Triton would rebuild our civilization after the earliest of the armageddons to reach the sea floor." He relaxes his posture, but stands proud. "I am Sharis Ahlorsath, a proud warrior of the Ahlorsath line, defender of the Triton Kingdom deep at the sea floor. As part of our duties, I have traveled to the surface world, scouring the lands for scourges to uproot, dark treasures to gather to protect the land walkers from their own greed and avarice, and deeds of might and valor that my descendants to follow shall bear my own visage upon their bodies in reverent remembrance." 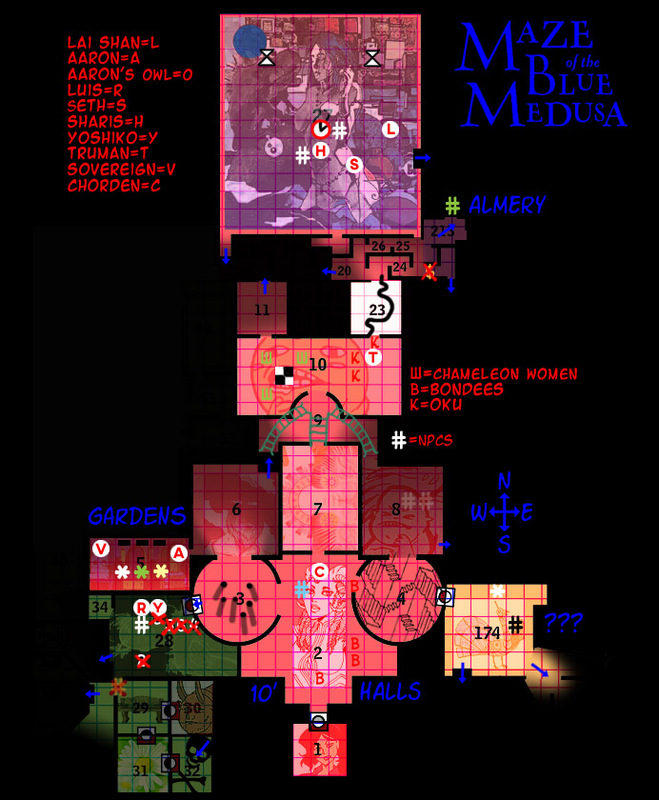 "The Fair Lady has told me in this maze lie the 3 goddesses themselves, and the mighty medusa who reigns here. So truly, what greater deed could there be, than to rediscover goddesses long since lost to time, and to best the warden who holds them?" "Hmnnn... guess there's no 'elping it." Yoshiko observed trail of vines from the Boyfriend. "In that case I'd like you t'elp me find his roots and pull em out. Transfer em t'say... a pot o' dirt. Should be some with th'gardening tools there." Torgos Zooth vanishes into light. "Find me in the Almery if you find out about my sons, small one. Good luck on your search." His words echo behind him, leaving you with the mess of scrolls. Fiddling with the first scroll, the one labeled as a document refuting scale-shape and its alleged relation to certain socio-behavioral markers in lizardfolk, you find additional writing in the margins! This is in fact a cleverly hidden scroll of the Stone to Flesh spell! In (Room 151), you find two automated weaving machines producing and unproducing the same tapestry. The handle on each enchanted weaver slowly clicks round, notch by notch. One makes, the other unpicks. When the cloth reaches its end, the process simply repeats back the other way. The pictographs reveal that the tapestry is a record of The Nyctocaust. A cursed event that, due to its nature, can never be forgotten, or fully recorded. This endlessly destroyed and recreated tapestry is the only record that exists. Right now, only one moment in a grand scene is depicted: a rain of burning books. At the rate the weavers are working, the next scene in the illustrated tapestry will not be revealed until tomorrow. The memorial continues in the dark room to the East. Over the doorway (where hangs a heavy black curtain instead of a door) there is a warning in many known languages, from Common and Reptilian to even languages you cannot recognize. "BRING NO LIGHT INSIDE" the entry warns. Chronia grows increasingly excited as you tell your tales. With every flex her expression dances between curiosity, surprise, and delight. She is well drunk by now. Her breath falls from her lips like cold mist, and she wipes her lips. "You're truly just as amazing a Triton as I would've believed," she commends you. "I'm so glad to hear the Tritons devote themselves to heroism, and to noble goals. I think it suits them, and...well as penance goes it should alleviate their guilt in the eyes of history." She smiles. "We don't all get that chance. I hope you do get to make up for your people's mistakes..."
"And to be sure, the rescue of the famous Three Goddesses would be such a feat, worthy of your great power. But there are a number of problems, and I doubt your quest will end how you think it will end." Ashen begins to protest, but a clearly annoyed Chronia motions for her to be silent, so she obeys. "Enough of you, Priestess," Chronia hisses. "My sisters and I have pretty strange relationships with the world around us. I'm sure you felt something when I left my room. I can hardly travel the Maze without disrupting the flow of time. Zamia, beloved by all, and Charity, the ender of strife, have similar situations. And even if we did make it back outside, I only fear everything would start back up again. The Triarchy, reborn?" She spits. "No, we're better than that now." "Also, you really think you can kill Psathyrella Medusae, anyway?" She looks worried for you. "Oh, sweet hero. Armies have tried. Gods have fallen in the attempt. No, don't underestimate Ella. That's always the first and last mistake." "But...perhaps you won't leave empty handed? I have something to grant a noble warrior, in return for a favor. It is said my tears have an affect craved by mortals. Have you heard of the Tears of Time?" 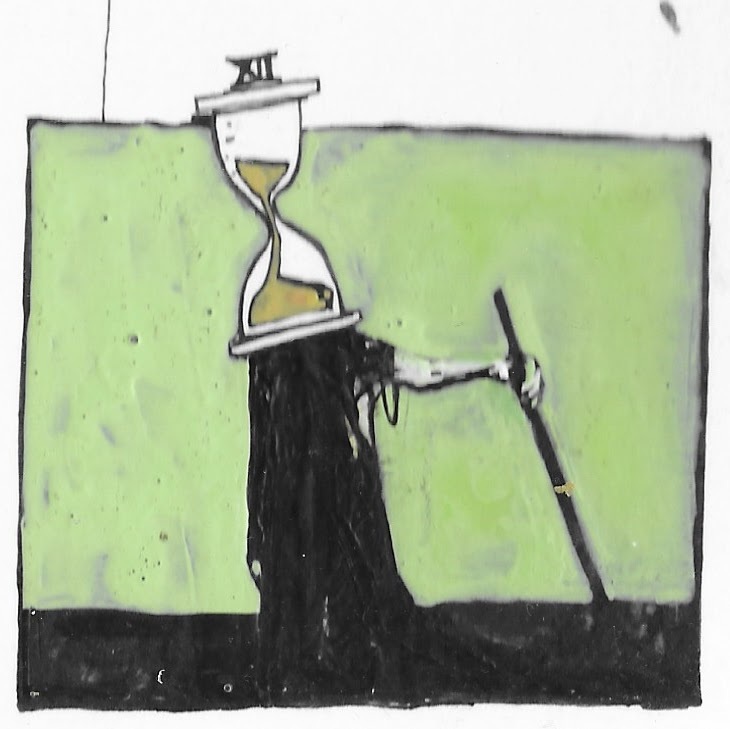 The hourglass men observe the room calmly. Beyond them on the far North wall is a half-shattered glass curio cabinet stuffed with aged books and knick-knacks. As you rest, your mind begins to stir with images of flashing blades in the dark. You see yourself duelling a great opponent, their face in shadow, their blade quick as lightning. In the final moments of the duel, something shifts, as if the ground moves or gravity tilts. You only see blood and blackness, and in your heart know that you've lost this battle. Was it through failure of your own training, or your opponent's trickery? The familiar face of Sir Grace stands somewhere in the night, calling out to you, waiting for you to join him in death. You skirt the shadow room where you lost your foot, and enter (Room 6), where lies the corpse of an old man. You go West to the room where Sovereign is resting. First you see two skeletons on the floor, wearing garments similar to the old man in the previous room. You see 3 stone thrones against the North wall (with space for a 4th). Each throne has an inscription on the chair-back and slots in the right armrest. The West wall has a large inscription stretching from the ceiling to the floor. Subfoetens, Prince of Spring, whose reign is yet to come"
But anyone will take me from you." On the south side of the room, three knights kneel in silent vigil over the empty thrones. Each knight's armor is a different color: green, gold, and shiny chrome. Each of the knights hold a sword in their hand, and each of the three swords have different patterned hilts. The green knight holds a sword with a hilt of rust-colored metal etched like grapevines, the pommel resembling a bunch of grapes. The gold knight's sword hilt is gold-plated with a pommel shaped like a little crown. The chrome knight's sword hilt is an ashen pewter color, shaped like a tree. Beyond the warnings and the heavy black curtain, you find an eternally dark sculpture memorial to the worst event in Reptile Empire history. Creatures with lesser vision than yours would have to navigate this exhibit by touch. The walls and even floor are covered in a gigantic raised-relief mural of skeletons and death, embossed scenes of horror and the last days of the Empire's capital city, Nyctopolis. The whole room resonates a creepy calm. During the decline of the Reptile Empire, likely in the last days of their war with the Triarchy, an attack was launched on Nyctopolis that burned the tallest towers and killed the city's guardian dragons. You find the engraved images of several dragon skulls in the floor, forming almost a flower pattern. There is an image depicting a king, perhaps ruler of the reptiles. 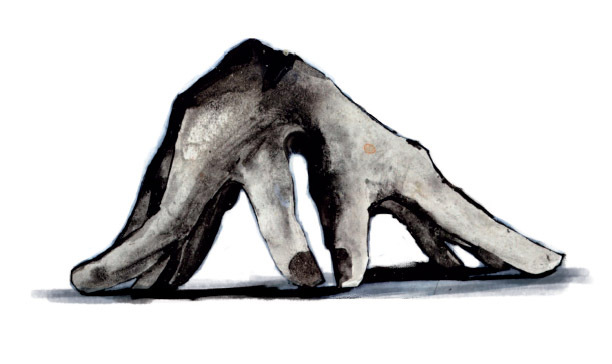 In the far end of the room, scratching quietly at the floor, you see a creature like a moving statue. Almost as soon as you raise your blowgun the hand-golem scrambles forwards. Like a bouncer, it shoves you out through the black curtain into the weaving room. For as long as it remains in the memorial sculpture it will deny you access. Leaning against the wall near the first weaving machine, a darkly hooded figure in a black-and-white bird mask watches with arms folded. Two others in bird masks enter the room from the South. 'Not too smart-oku," the hooded figure says. "It's rather poor taste to fire a weapon in a war memorial, innit? Unless your goal was to get a rise out of the Curator. If so, you've succeeded-oku! He gets real touchy when works of art are at risk-oku!" 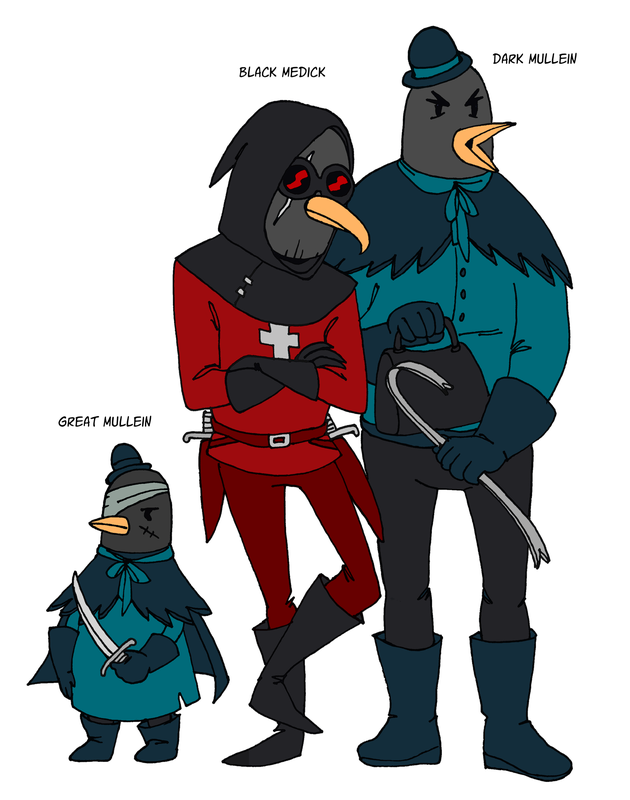 The two other bird-masked people wear matching leather armor, but one is very tall and one is very short, almost as short as you. They chirp and coo idly as they wait for further instructions from their boss. "Well, you'll have to do-oku," the leader bird sighs, without waiting for your response. "You're gonna play lookout for us, see, while we do a quick job." The trio of birds move back South to the messy scroll room (Room 149). Kicking aside scrolls, they clear a space next to the East wall. From their backpacks they prepare chisels and hand-drills. "S'a room back here with no door-oku," the leader explains. "Just keep an eye out, shorty. If that Curator peeks out, or anyone else, let us know-oku!" You sit in the darkness of the quiet garden room, formerly home to a sextet of hand-carved memorial statues, now home to only one. The boyfriend statue paces the room to protect you while you recuperate from your recent ordeal. When your rest is over, you realize that the walls and floor are blooming with new vines. In the spaces where Aaron had burned the life-giving vines, twice as many have grown in their place. The vines seem to scatter to other rooms Southward, having their origin at some point North of you. The Id Pig's carcass is gone, having been quietly taken away by some unknown predator. There are no drag marks to indicate where it might have gone, but several disturbed flagstones hint that the body may have been dragged underneath the floor. Agrimony chirps nervously. "Don't know the sound! But I'm sure it's not good-oku!" She and Yarrow try to help you heft Tutsan to the next room. Tutsan remains silent but sounds like he's trying to speak. His body is rigid as a statue, his hand tightly clutching the stone chess bishop like a man possessed. You reach the Northeast door opening to a stark white room with a 6-inch wide black line running straight across to the North wall. As you reach the entryway, a cluster of sinuous figures appears from the Northwest door in the room you are fleeing. A trio of lithe machete-wielding female reptilians emerge, their bulging chameleon eyes rolling around to survey the room. "You there! Halt!" 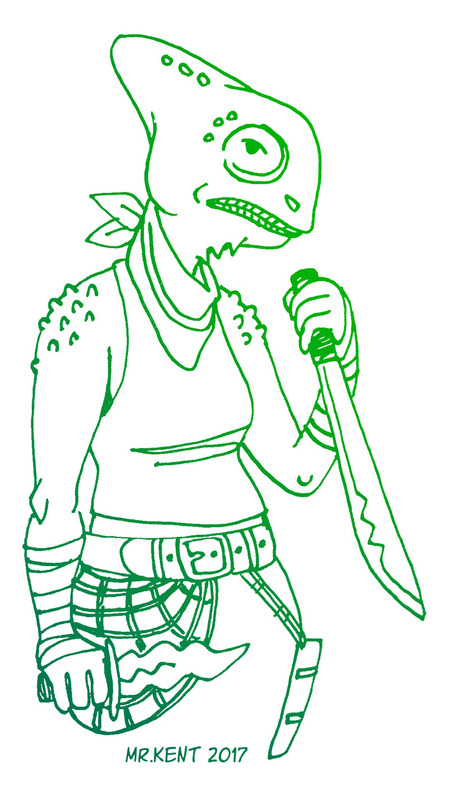 the boldest (and shortest) chameleon woman shouts at you, pointing a delicate clawed finger. As she moves, her many bracelets jangle, the telltale sound you heard from the other room. "I, Nadzikambia of the Neonate Empire Wilderness Bureau, claim this Maze as a Lizardfolk Heritage Site! Its treasures belong to us, by ancient rights!" She flicks her curly tongue to show you she means business. While she talks, the other two chameleon women (one with a rusted holy symbol at her neck) case the room, searching for valuables but finding only junky toy-things. Noting the relative uniqueness and craftsmanship of the oversized chess set, the lizard-girls begin throwing pieces into a large bag. The lead lizard points at the chess piece in Tutsan's hand. "Come on, give us the goods, warm-blood!" Truman sighs. Out of the frying pan, into another frying pan. At least there wasn't any fire. Yet. "Would you please put down your weapons first? This place is enough of a deathtrap without us civilized peoples at each other's throats. Besides, if you kill us, I can't tell you about the one who means to destroy this place." Truman motions for the still-conscious Oku to set Tutsan down, gently, on the floor. Yoshiko winced as she patched up her wound. She grumbled. "Damn scatterbrained bear leavin' whilst I was speakin'..."
She stood back up after the pain from had subsided a little more. "Oi, twinklemutt, do me a favor an 'elp m'sniff up th'source o' th' vines woul'dya?" She began to trace the vines coming from her boyfriend towards their source Northwards. One last cursory glance around the room revealed no items of particular value. Disappointed, Lai Shan returned her attention back to Chronia just in time to catch her warning about the Medusa. "If you say she's that powerful, we'll definitely heed your advice. But power in excess often forgoes guile, and the plenty of us are gifted with wits sharper than any blade. There's no need to slay what can instead be outsmarted!" Lai Shan crossed her legs in her seat, as if to punctuate her boast. "Tell us about this favor, yeah?" As Aaron studies the room, its riddles, and the three knights with their swords, a small hoot echoes out of the folds of his hood. "I see," he mutters, listening to the tiny thoughts beaming from his familiar's mind into his own. "So these three knights all came from the sword wounds on the body in that other room..."
Limping from knight to knight, Aaron grumbles to himself and makes a lot of "hmmm...." sounds before turning to the golden knight. "Um... will you allow me to borrow your sword so I can put it in that throne?" he gestures to the first throne. "Or is there something I have to do first?" The vines run along the North wall but actually lead you to the shed in the West, which seems overrun with greenery. There is a crack in the West wall here, loose bricks that can be removed with enough force. You feel refreshed after your rest, getting up in time to see Yoshiko and her Boyfriend wander towards the source of the vines. The bacon smell has cleared the air. The golden knight clutches the golden sword close to his chest. 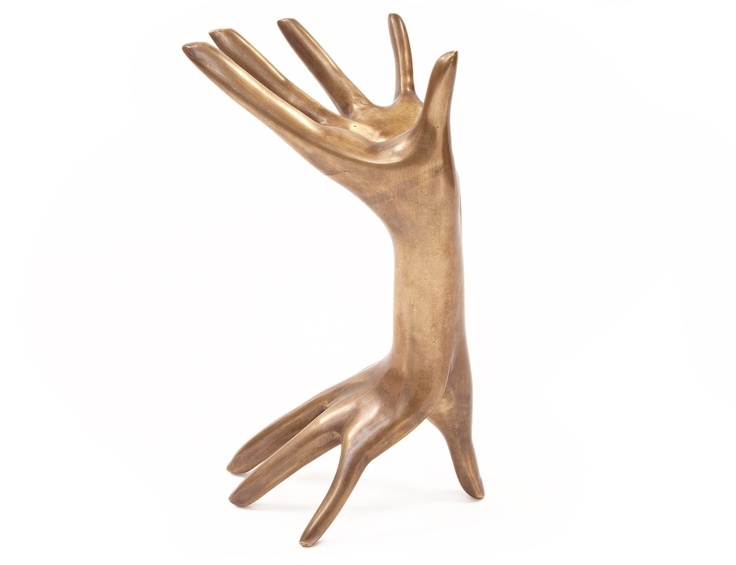 With his other hand, palm facing you, he gestures for you to remain at a distance. You rouse from rest in time to see Aaron approaching the knight in gold armor, who holds the crown sword. The leader, identifying himself as Black Medick directs the other two as they begin to drill through the scroll room's East wall to obtain what's inside. The big and little thieves are named Great Mullein and Dark Mullein. When the hole they create is large enough for Great Mullein, the little thief jumps in. The hole is big enough for you as well. "Be on the lookout," Black Medick reminds you as he and Dark Mullein peer into the hole after their friend. "We don't want trouble with that Curator, or any o' them lizard-mummies what run this place. We saw you talkin' with the moon-man Zooth, so don't get any ideas about squealing to him!" Yoshiko tiptoed and tapped on her Boyfriend's shoulder and pointed to the loose bricks. "Mind 'elpin' me remove these, love?" Yoshiko will assist Boyfriend in removal of the bricks if he decides he wants to do that. Boyfriend looks at you, looks at the wall, nods, gets to work. He pulls large hunks of brick out and hands you some pieces, not sure of what to do with them. The chamber beyond looks like a torch-lit mausoleum. Vines cascade from the walls and ceilings here, resembling beaded curtains. He didn't even have the chance to ask Aaron if he wanted any help walking with the improvised limb done out of the hooves of the pig. But the bugbear seemed too happy and excited to test his new prosthetic, despite the obvious pain he was in. Luis couldn't think of anything to say that would make Aaron stop. What would he be able to do anyway? In the strife against the statues, he barely managed to hold his friend's weight. Absent Minded, he didn't realize he was being guided into the room by Stone Boyfriend. When he came back to it, he moved his head around, not really knowing how he had gotten here in the first place. "Er... Thanks" He commented, assuming the statue could even talk or understand "[Thank you]" he tried in Sylvan this time. Luis was not sure if the statue had understood Common or Sylvan. All he did was start walking around the room, keeping an eye on the wolf. He seemed to... Be protecting Luis? "[I still don't know if you understand me but... I apologize for the rumble back there]" Sparkly sighed as he examined the statue's body "[You got hurt, didn't you? We could have tried a different approach... None of us were expecting things like these to happen. We just used to take smaller missions, at least compared to this...]"
After that, he didn't say anything else, and tried to relax. There was nothing more that could be done at the moment. He felt really guilty about the recent fight. He was supposed to keep everyone and anything from harm. Yet he had used his powers to destroy one of them. He looked at Monomythica's spiritual weapons... He let out a groan before calling them off, both Pencil and Book vanished slowly. "You're dissapointed in me, aren't you?" He pretended Monomythica could hear his thoughts "I wouldn't blame you..."
Despite his wounded shoulder, Luis is back to full health! "It's Luis... My name is Luis..." He sighed, wasn't really in the mood to argue right now. He stopped and looked back again at where the pig should have been... The place was now covered in new flora. This made Luis smile for some reason. Perhaps this place had a chance to recover itself despite what Aaron and him had done. Forgetting completely about the animal that had once laid there, he continued his way, following cat, and her love. What in the world had she been doing here? Luis stood behind them awkwardly, as he couldn't really help with the bricks because of his injured shoulder. So he just looked and sniffed around, to see what else he could find, and maybe be helpful to cat and her... Lover (?). He hated that feeling of uselessness. Aaron takes a step back, holding up a hand in a "please don't get angry" gesture. "Hoh boy," he sighs, "I really don't want any trouble. Been in enough already today." He winces, shifting his weight. "So let's start here: do you understand me?" When you sniff the air, you catch a faint trace of the roast Id Pig, and suspect it was dragged off East somewhere. You also notice a new scent wafting from the hole that Yoshiko's Boyfriend created. It's the scent of votive candles, usually lit graveside. You remember back in the Temple of Monomythica, the Altar of Unfinished Quests always had these candles lit in memorial to those who left on quests to prove their worth, but never returned. You're in the middle of asking the knight in Dwarvish when it responds. It then says the same single word in Elvish, Common, and Goblin: "OURS." The other two knights repeat the word, and hold their swords tightly. Yoshiko signalled for her boyfriend to enter first before helping her in.